Motto: "Rerevaka na Kalou ka Doka na Tui"
"Fear God and honour the Queen"
The Dominion of Fiji was the official name of Fiji between October 1970 and 6 October 1987. 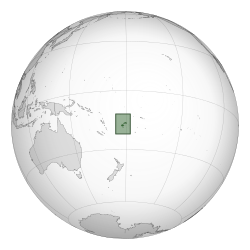 When British rule ended in 1970, the Fijian Islands were given independence as a Dominion, in which the British monarch, Elizabeth II, remained head of state as Queen of Fiji, represented by the Governor-General. The Republic of Fiji, removing Elizabeth II as head of state, was proclaimed on 6 October 1987 after two military coups. Elizabeth II visited Fiji before its independence in 1953, 1963 and March 1970, and after independence in 1973, 1977 and 1982. "With humble duty, I wish to submit to you the following advice, acting in my capacity as your representative in Fiji. Owing to the uncertainty of the political and constitutional situation in Fiji, I have now made up my mind to request Your Majesty to relieve me of my appointment as Governor-General with immediate effect. This I do with utmost regret, but my endeavours to preserve constitutional government in Fiji have proved in vain, and I can see no alternative way forward. With deepest respect, Penaia Ganilau, Governor-General." Following the establishment of a republic, former Governor-General Ratu Sir Penaia Ganilau became the first President of Fiji, in December 1987. "Fiji: Polity Style: 1970-2017". Archontology.org. Retrieved 26 January 2017. "Fiji: Governors-General: 1970-1987". Archontology.org. Retrieved 26 January 2017. Ben Cahoon. "Fiji". Worldstatesmen.org. Retrieved 26 January 2017. This page was last edited on 4 February 2019, at 01:49 (UTC).